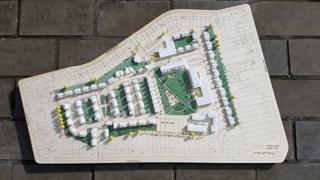 A plan for the largest council-led housing scheme in York for nearly 30 years has been unveiled. Plans for the 140 home Lowfield Green development in Acomb includes council and other social housing, a 70-bed care home and a number of self-build plots. Conservative councillor Sam Lisle, from City of York Council, said at least 20% of homes would be affordable housing. If planning permission is granted work would start next summer with the first homes made available in 2019. Mr Lisle said the project is different to the usual approach where land is sold off to a private developer. "What we a looking to do now is actually develop this site ourselves," he said. "To realise some of the value of that through sale of some of the properties we do build. "What it allows us to do is have much stronger input to what is built out on the site." More than 30 of the proposed homes would be for people aged over 55, with a mix of flats and bungalows all with wheelchair access. In addition, there will be 26 plots made available to self-builders.